I know it's a little late now for nail art with a spring theme as it looks like we may be heading into autumn, but as soon as I saw the base shade that I've used for this inspiration struck me. I recently won one of London Beauty Queen's RT competitions to win a bundle of goodies and one of the products I received was this gorgeous summery green from Rimmel called District-ly Come Dancing (I love the name as I used to be a Latin American dancer!). It's not a grass green shade but it does makes me think of gardens with pretty white flowers. 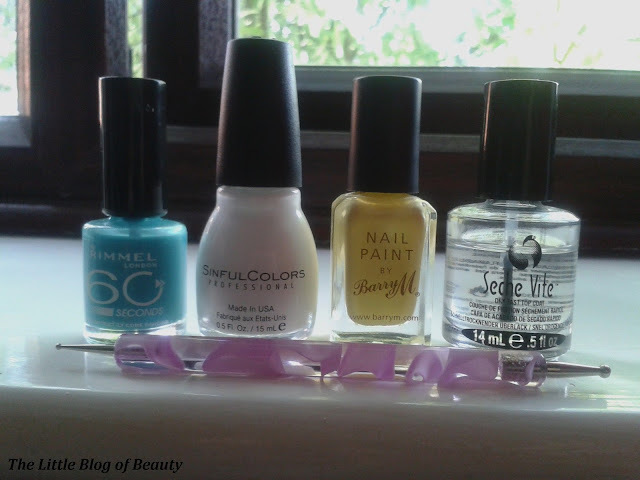 As my camera changed the colour of the base nail varnish from green to blue I've had to take these pictures on my phone. The phone pictures are at least green but the colour is still a little bit darker than shown on the pictures. I then applied two coats of my green base followed by a coat of Seche Vite to seal the base. Using the largest dotting tool I have I then made a rough circle of white dots to make the petals of the flowers and used the same dotting tool to dot a yellow centre in each flower. I then used a much smaller dotting tool to add the smaller dots and then sealed it all with another coat of Seche Vite. 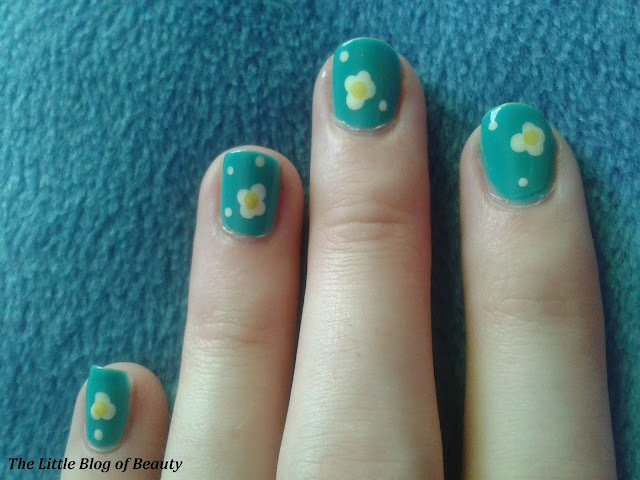 For the white flowers and small dots I used Sinful Colors in Snow Me White and for the Yellow centres I used Barry M Lemon I/C (which I've been told means Ice Cream). Next time I would possible try a larger circle of white dots to make more petals, maybe with a smaller dotting tool, but this might then leave too large a space to fill in with the yellow centre. I think more petals might look slightly better as they currently look a little like fried eggs! The yellow may also be slightly too light against the white so I might try a darker yellow or possibly an orange. But in general I'm really pleased with this look. 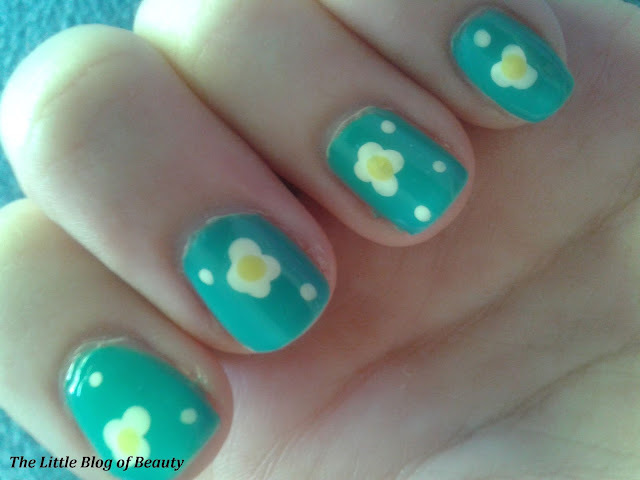 What do you think of my spring garden nails? Awwww these are so cute! I very rarely do nail art, but if I was it would definitely be something like this. I could never do some of the really intricate stuff like Nailasaurus does, it's so amazing though! That is so cute! I don't think I could do anything like that to my nails, lol.